I've combined my fishing and research experiences to create a suite of informative and entertaining PowerPoint presentations. In these presentations I combine fish ecology science with practical fishing examples to help you become a more successful angler. Please contact me to inquire about availability and fees for appearances. 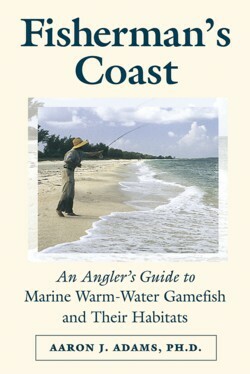 This presentation is based on my book Fisherman’s Coast, and covers each of the chapters in the book, as well as seasonality and life cycle information that helps explain some of the behavior of gamefish and their prey. I gear the presentation to focus on habitats and gamefish most appropriate to the audience. Not all flats habitats are equally good habitats for gamefish, and some habitats and locations only fish well under certain conditions or certain times of year. This presentation uses photos and videos to demonstrate key characteristics to evaluate to give a better chance at finding fish. This presentation is a mixture of a PowerPoint slide show and fly tying demonstration. The slide show includes photos of gamefish prey and flies to imitate them, the habitats where the prey occur, and prey behavior. I also present strategies for fly presentation. After the slide presentation, I tie a few of the flies featured in the presentation. I gear this presentation to match the interest of the audience. This presentation contains essential information for developing a strategy for fly fishing for bonefish. When and where do bonefish spawn and how does this influence when and where you will find them? Learn how the main bonefish prey items change by bonefish size and by location, and flies to imitate these prey. Learn how bonefish use tides and habitat characteristics to narrow down the search for these elusive fish. Whether headed to the Caribbean on a hard-core fishing trip, or headed to a Caribbean island with the family or on business, you need to know how to maximize your time to give yourself the best chance to find good fishing. For example, although most Caribbean islands are not considered ‘destinations’ for fly anglers, many do provide a grab bag of opportunities for those willing to walk some shorelines with a fly rod. And anglers headed to locations that offer good opportunities for bonefish, tarpon, and permit will benefit from learning the intricacies that will help to improve the trip. This presentation is the next step up from the Fisherman's Coast presentation, which provides an overview of the Fisherman's Coast Approach. The Three Habitats presentation provides detailed information on the intricacies of three coastal habitats, including prey, effects of tides, weather and season, flies, and strategies. Common habitat combinations are: mangroves, sand flats, and shorelines; mangroves, beaches, and seagrass; marshes, oyster bars, and shorelines.